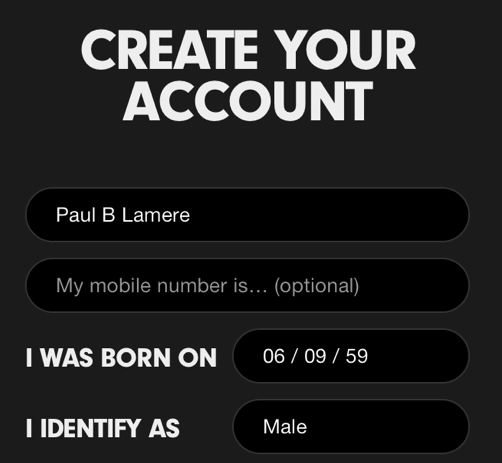 This entry was posted on February 13, 2014, 2:09 pm and is filed under data, Music, research, The Echo Nest, zero ui. You can follow any responses to this entry through RSS 2.0. Both comments and pings are currently closed. 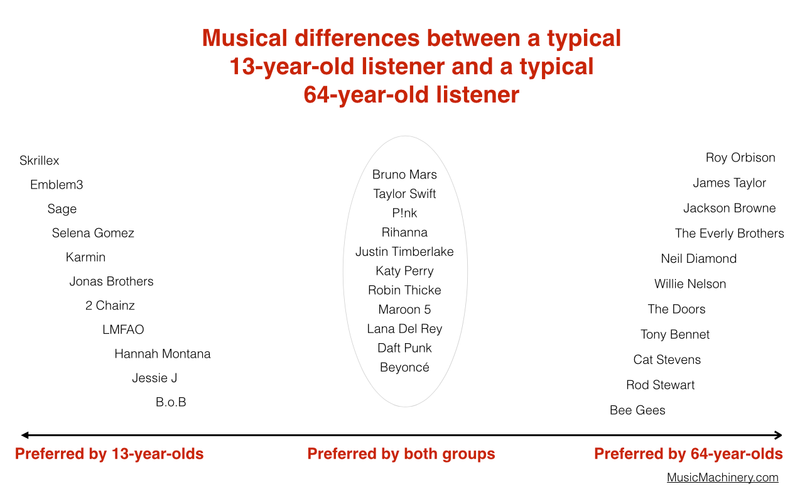 In the 4th graphic with the top artists for 13/64 year olds, shouldn’t Taylor Swift be highlighted? 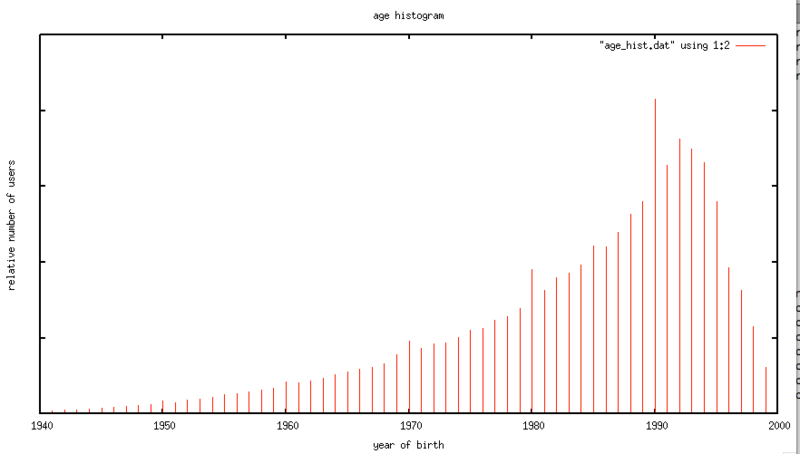 Your data tends to support this “older imprinting” hypothesis. 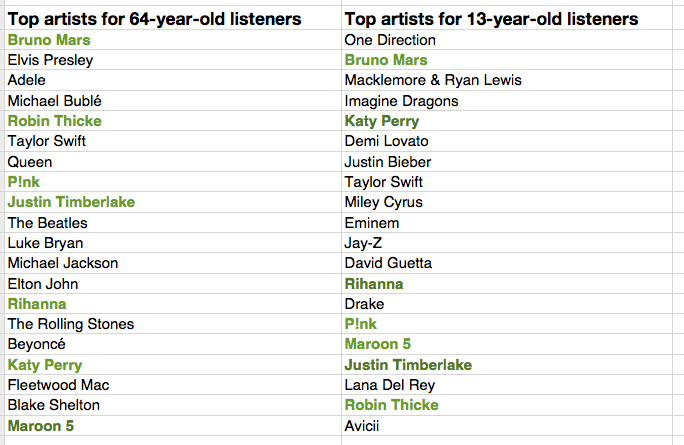 It’s interesting that the 25-34 year olds have the most musical artists and and number of plays. 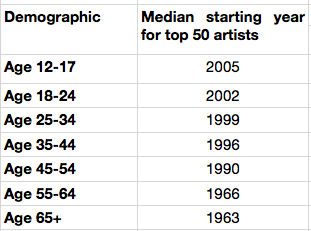 Further, if you work backwards people with the Boomer age groups—50+ we see that many of those artists are exactly the artists who were popular during their 20s. This implies that the music that the 12-17 year old age group is listening to day will not be the artists they will in turn be listening to when they turn 60 but artists that most likely haven’t even arrived on the music scene yet. 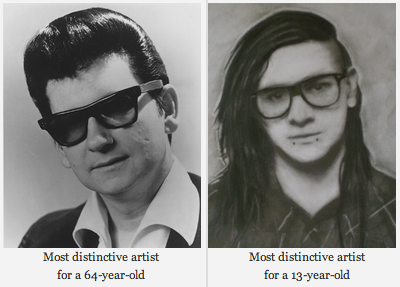 The “nobody likes music from the 70s or 80s” thing seems wrong to me. 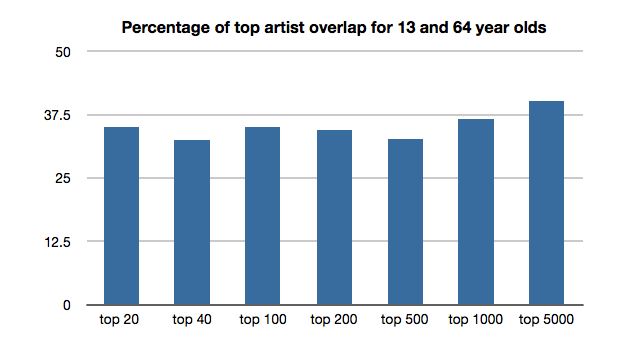 Looking at the 14 most distinctive artists for 35-44 year olds that you posted above (and excluding The Next Big Thing because I can’t seem to find any information about them), 56 of the 137 studio albums they have released, or 41%, came out in the 70s or 80s, which would be roughly consistent with that age group having musical preferences spread out evenly across the years in which they’ve been alive. 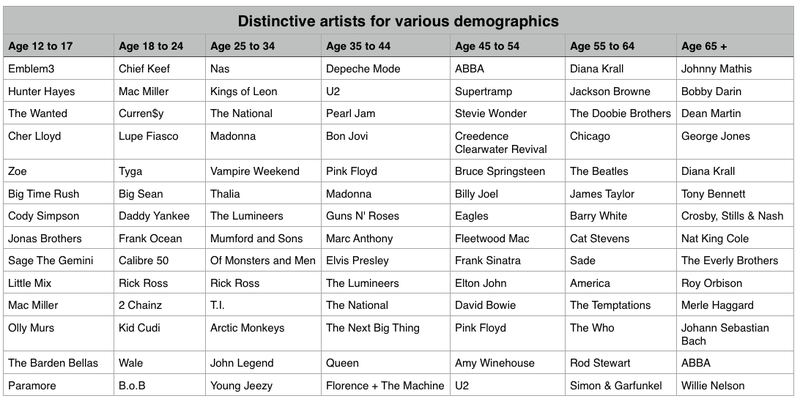 Glancing at the 45-54 year old age group’s most distinctive artists, I would guess a similar proportion of their albums came out in those two decades. Sam has a good point, and wouldn’t it be possible to find data about the average song release year rather than the year of a band’s formation? Although a problem would be that spotify seems to use the year of CD reissue rather than the actual release date for a lot of albums. Interesting read. And also verifies for me that some of our marketing efforts we’ve been doing to market my music is on the right track.